Are we in Italy ... no, we are in San Jose! A new upscale, trendy neighborhood appeared in San Jose in 2002. Today - this is a fabulous area to explore whether your alone or with your friends. Next time you visit - stop and look at the details throughout the 3 blocks. Many artifacts were imported from Europe - grates, fountains, and even the front of church which is the entrance to a wine bar. Try to find the Garlic on the outside of the building fronts. Garlic represents when this area was agriculture... once called Valley of Hearts Delight. Find a series of art work showing the phases of the moon. (Moon Phases are in the image above) and a pizza tool by the Pizza Antica sign. Yes, there are many hidden surprises throughout these blocks. A local person may know about these. Wait, there are more pleasant surprises to find. I need to compliment the team I worked with at Left Bank Restaurant during a meeting. It is these local people in a destination working together that I admire in the travel industry. Within 4 hours I felt as though we were a team. Supportive, communicative, and working together. Thanks to this team - they made this evening an excellent experience for us! The insider tip today - please remember the many people in destinations, working in all types of positions, who want to create a fabulous experience for you. What has been your experience with meeting people in the destination? Did you find this article helpful? Please tell us below in the comments and share with this with your friends. I saw this article and want to share. It is very important to verify information of travel companies. There are so many deals now that may be too good to be true. It probably is too good. As this article reads, it was the tour directors left to help travelers. 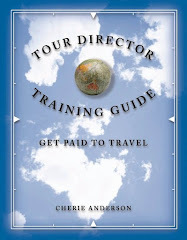 Another reason to have this valuable source - the tour director - on tour. My own experience was when I was ready to purchase international airfare (last minute). I found a great price on the internet. When I did my due diligence of the company advertising online (found on one of the major consumer online sites), I decided to NOT to reserve it. I called a local Travel Agency which I know from my professional travel association to find a fare. They did. Same price. No headaches. Remember the National Tour Association (NTA) in the USA requires tour company members to have a bond when doing business. California and Florida requires all travel professionals (agents) selling any type of travel to residents of their states to be registered within their state. Professionals are required to set aside clients monies (deposits) in an bank account or have a trust fund established - that is not affiliated with their own monies. The state agency sets aside monies for consumers in case company is going out of business. A travel professional will have this FL or CA number listed on all advertising material. This includes travel businesses outside of these states. I arrange hotels, cruises, and other tour company packages for you. I work with these companies and know their operating procedures. I will direct you to great travel agencies to reserve air for you as well. Another reason to use a travel professional you know to reserve is - we already have a network of people established which we may ask questions. We are all specialists - we know who to ask to make other reservations like air, hotels, and cars. Travel Safe. Have Fun. Enjoy. Silicon Valley is comprised of several small communities from San Jose to Palo Alto. Summertime brings weekend festivals and music in the parks throughout many Silicon Valley communities. One well known community is Campbell, CA. Campbell is north of Los Gatos and surrounded by San Jose - is actually known for many of the start up companies located here. Entrepreneurs may take time out and visit either downtown Campbell or Pruneyard for relaxation. This month I found Music on Main Street at Pruneyard Shopping Center in Campbell. The Main Street through the Center is closed off and people enjoy sounds of local bands from 6 - 9 p.m. on Wednesday evenings. Tessora’s Barra di Vino is a fun place to relax on the patio and Rock Bottom Restaurant & Brewery is always a favorite - there's happy hour drink price too. There are a wide range of restaurants to choose from throughout this shopping center from Cafe Artemis, El Burro, and Outback Steakhouse (and more!) ~ remember to save for a special treat from Sugar Butter Flour or ice cream from Cold Stone Creamery. The Pruneyard Plaza Hotel, a tuscany inspired hotel for travelers is also at the Pruneyard. Silicon Valley is famous for start ups and entrepreneurs ~ networking is not new to Silicon Valley and may be found in unusual places as people relax after work! Meetings & Tours ~ Try our San Jose Sampler Day Trip!